Artistic representation of a neutron star. The layer of "nuclear pasta" would be located in the innermost crust, near the core. A rare state of matter dubbed "nuclear pasta" appears to exist only inside ultra-dense objects called neutron stars, astronomers say. There, the nuclei of atoms get crammed together so tightly that they arrange themselves in patterns akin to pasta shapes — some in flat sheets like lasagna and others in spirals like fusilli. And these formations are likely responsible for limiting the maximum rotation speed of these stars, according to a new study. This new phase of matter had been proposed by theorists years ago, but was never experimentally verified. Now, Pons and his colleagues have used the spin rates of a class of neutron stars called pulsars to offer the first evidence that nuclear pasta exists. Researchers have observed dozens of pulsars, but have never discovered one with a spin period longer than 12 seconds. "In principle, that is not expected. You should see some with larger periods," Pons told SPACE.com. A longer spin period would mean the star is spinning more slowly. But the pasta matter could explain the absence of pulsars with longer spin periods. The researchers realized that if atomic nuclei inside the stars were reorganizing into pasta formations, this matter would increase the electric resistivity of the stars, making it harder for electrons to travel through the material. This, in turn, would cause the stars' magnetic fields to dissipate much faster than expected. Normally, pulsars slow their spin down by radiating electromagnetic waves, which causes the stars to lose angular momentum. 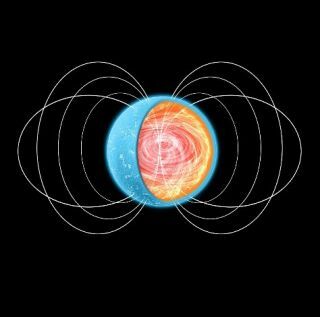 But if the stars' magnetic fields are already limited, as would happen with pasta-matter, they cannot radiate electromagnetic waves as strongly, so they cannot spin down. This keeps the pulsars stuck at a minimum spin speed, or a maximum spin period. "Making this connection between the observational astronomical effect, which is the existence of this upper spin period limit, with the need for this layer in the inner crust, is what makes the connection between observations and theory," Pons said. Neutron stars form when massive stars reach the end of their lives and run out of fuel for nuclear fusion. These aging stars explode in supernovas, their cores collapsing into small, dense objects. The resulting masses are so dense, in fact, that normal atoms cannot exist anymore. Instead, protons and electrons essentially melt into each other, producing neutrons as well as lightweight particles called neutrinos. The end result is a neutron star, whose mass is 90-percent neutrons. In these stars' crusts, which have been found to be billions of times stronger than steel, normal atomic nuclei made of protons and neutrons can still exist, albeit densely squished, and this is where the new pasta formations appear. In normal matter, the separation among nuclei is huge (relatively speaking), as positively charged atomic nuclei don't like to be near each other. "But in neutron stars, matter is very packed and nuclei are so close to each other that they almost touch," Pons said. "It's like a huge, gigantic nuclei, a huge continuum." The research was published June 9 in the journal Nature Physics.